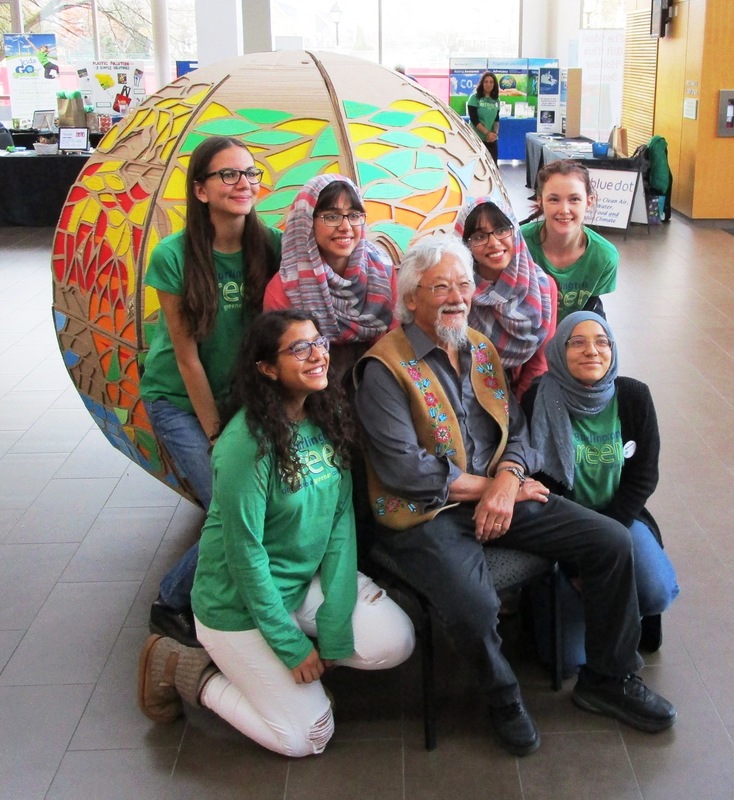 David Suzuki poses with BurlingtonGreen and Blue Dot youth volunteers in front of a model of the Earth. Each colourful puzzle piece contains a pledge made by youth earlier in the day. Thank you to BurlingtonGreen Environmental Association for hosting another successful event, called Connect the Dots, in partnership with the David Suzuki Foundation. The event helped to raise awareness of the Foundation’s Blue Dot movement, a campaign to include the right to a healthy environment within the Canadian Charter of Rights and Freedoms, and to inspire everyone to take action. On June 22, 2015, the City of Burlington became one of many municipalities across Canada to pass the Blue Dot Declaration for the Right to a Healthy Environment. Over 1,700 youth participated in the morning session, both in-person and via live streaming. Local Eco-Heroes including Julia Barnes, Kale Black, Jackie Prime and Andrew Wong demonstrated through passionate speeches that we can all make a difference. This was followed by a musical performance by Cameron Brown and a keynote speech by Dr. David Suzuki. That evening, a sold-out theatre full of guests were treated to three time JUNO Award nominees and Billboard charting band Sultans of String, followed by a keynote speech by Dr. David Suzuki and another musical performance by international speaker and storyteller Cameron Brown. 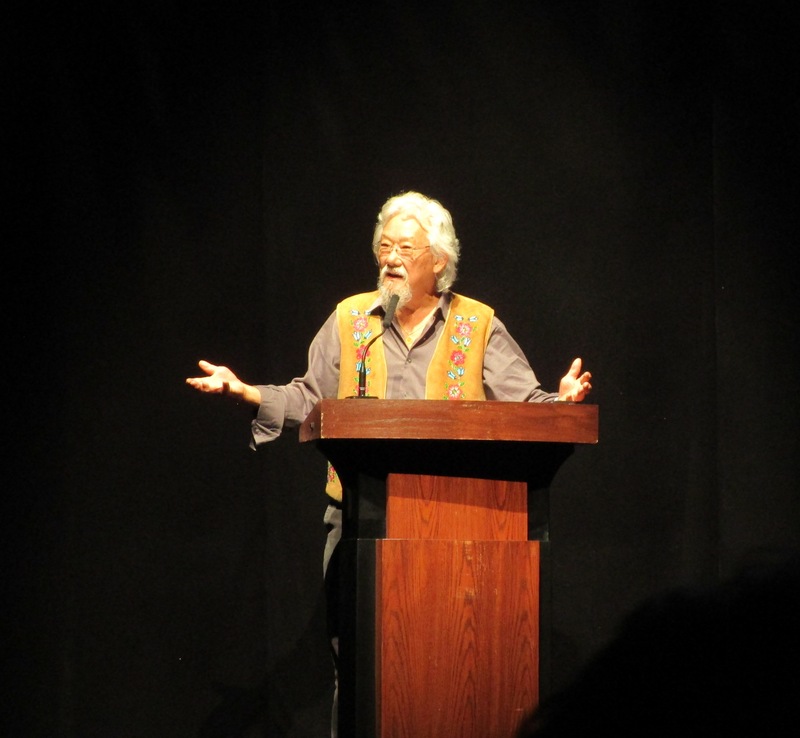 Dr. David Suzuki shared some personal stories with the audience and encouraged everyone to make a difference. The City of Burlington was proud to be a sponsor of the Connect the Dots event and to staff a display to engage the community about our environmental initiatives. Congratulations BurlingtonGreen on your 10th anniversary! Take Action Burlington! Collectively we can make a difference and improve our environment.